Message claims that Starbucks refused to donate coffee to Marines stationed in Iraq because the company does not support the war. This is not true !!!! 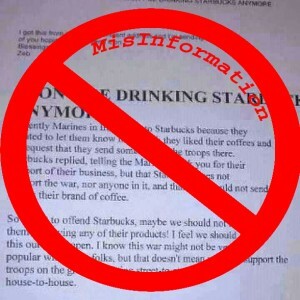 The claim that Starbucks did not support the Iraq war or US military personnel is an old rumour started in 2004 and has been resurrected over and over without substance and the message should not be forwarded. This entry was posted in MisInformation. Bookmark the permalink.